Campaigners gathering for the annual boycott demonstration at Nestlé (UK) HQ in Croydon (22 May 11:00 – 12:00) will be targeting Nestlé's latest strategy for promoting baby milk and will be treated to a presentation by spoof marketing guru, Mr. Henry Nastie, who will explain the thinking behind the strategy. The company has rolled out logos on products in 120 countries claiming the milk 'protects' babies, despite the fact that babies fed on it are more likely to become sick than breastfed babies and, in conditions of poverty, more likely to die. The aim of the demonstration is to draw attention to Nestlé's continued violation of the World Health Assembly baby food marketing requirements adopted since 1981. The Assembly is currently meeting in Geneva to discuss a further Resolution addressing new marketing strategies. Monitoring conducted by Baby Milk Action and partners in the International Baby Food Action Network (IBFAN) finds Nestlé is responsible for more violations of WHA marketing Resolutions than any other company. "Marketing practices that undermine breastfeeding are potentially hazardous wherever they are pursued: in the developing world, WHO estimates that some 1.5 million children die each year because they are not adequately breastfed. These facts are not in dispute." “We have raised this matter directly with Nestlé, including at its shareholder meeting in April, and the executives defend these logos that falsely claim infant formula 'protects babies, and boasted that they have already rolled them out in 120 countries. We asked the Swiss Government office responsible for regulating transnational corporations for help and it asked us to supply the labels. We suggested it request these from Nestlé, which has its headquarters nearby, rather than require us to tour the world. The Swiss Government refused and closed the case, saying it wanted to hear nothing more about it." Baby Milk Action asked the UN Global Compact to investigate the Nestlé Creating Shared Value reports that it publishes on its website, which claim Nestlé abides by the International Code of Marketing of Breastmilk Substitutes and subsequent, relevant World Health Assembly Resolutions - it refused to do so, saying it is a voluntary system and said: "Of course, abuses of the 10 Principles do occur; however we believe that such abuses only indicate that it is important for the company to remain in the Compact and learn from its mistakes." “Although we have had a lot of success in bringing in national laws, there is no effective international system for regulating corporations when these don't exist or are not monitored and enforced. So it comes down to concerned people taking action to hold corporations to account and that is what we will be doing on Nestlé's doorstep. We have forced some changes from Nestlé and with enough support we will get these misleading logos and dangerous claims removed." Nestlé's 'protect' claims are appearing on formula around the world. 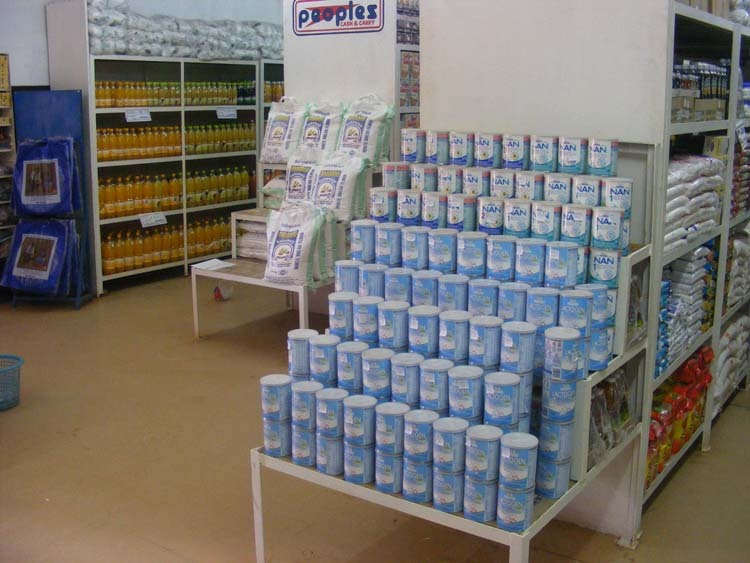 The picture left shows a display in a rural trading centre in Malawi, one of the poorest countries in the world, where under-5 mortality is 140 per 1,000 live births. 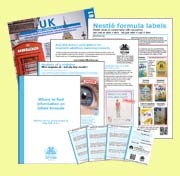 In a campaign in July 2009, Baby Milk Action supporters asked Nestlé to investigate why the instructions it claims to give about point-of-sale promotion were not being followed. Nestlé has stated that it has reissued its instructions. Mike Brady said: "Such promotion should not happen and we are pleased that our campaign forced Nestlé to investigate why its systems are failing. 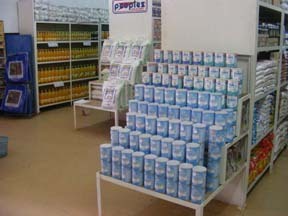 This picture also shows that Nestlé's misleading claims are appearing on baby milk in the poorest of countries. 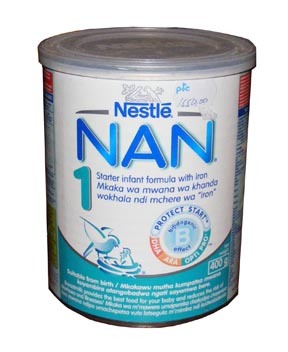 It is disgusting that Nestlé defends telling mothers and health workers that their babies are protected by its formula, when they are more likely to become sick and even die than if they were breastfed." Click here for a high resolution version. Nestlé makes significant investment in R&D and technology to deliver innovative products with scientifically proven nutritional benefits in many different areas. Concerning the 'Protect' logo, while all our infant nutrition products meet the needs of non-breastfed babies during the first critical months of life, the functional benefits that are encapsulated in the 'Protect' logo are the result of many years of intensive research on how best to improve the nutritional composition to stimulate the infant's immune system. The logo helps distinguish this particular formula from other less advanced products but does not claim in any manner that infant formula is superior to breast milk. The 'proven' nature of the claims is disputed by independent reviewers (see below). In addition, all idealizing claims are prohibited by Article 9.2 of the International Code (given above). The logo 'Opti-pro' does not refer to eye development at all, rather it refers to an optimised mix of milk proteins which when ingested, results in the infant having a blood amino acid composition which closely resembles that of an infant on breast milk. This represents quite an advance in the application of technology to superior nutrition and is explained in detail in the scientific information that we share with health professionals. Article 7.2 of the International Code, which states: "Information provided by manufacturers and distributors to health professionals regarding products within the scope of this Code should be restricted to scientific and factual matters, and such information should not imply or create a belief that bottle feeding is equivalent or superior to breastfeeding."